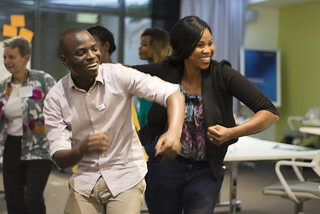 Participants began the week with ice breakers, and some goal-development exercises. They wrote down their goals of the week, ranging from improving English language skills to creating mentoring tools and engaging with different subgroups within their communities. The sticky notes were utilized to put into broader categories and posted on the wall for shared learning. As different goals were accomplished, participants moved the sticky notes from the “We Want To” wall to “We Did It” wall. Over the course of the week, participants divided into groups to develop projects with a goal to improve different aspects of their communities, such as equality for disabled people, empowerment for women, sustainable farming practices, and a higher quality of education for youth. 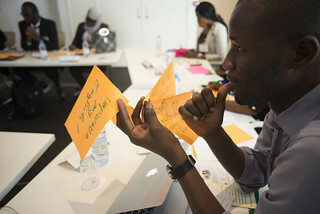 While every participant has his or her own ideas that fit under the aforementioned broad categories, the use of human centered design and other new concepts in the project development allowed them to develop their own ideas while also contributing to others’ projects and providing immediate feedback. At the beginning of this process, participants were allowed to move around to other groups to share their expertise and experience with others. However, later in the week they had to select a group and stick to it. Participants presented their projects and ideas for implementation at the end of the week. This was not the only presentation that participants gave. Each mentor-mentee pair was asked to give a 10-minute presentation about their country and what they thought made it special. These presentations were fun, with videos, laughter and even some dancing thrown in! Speaking of dance, this week was not just about all work and no play. Participants had the opportunity to also attend group dinners and get to know each other in social events. One such event was on Thursday night, when a local group of musicians came to play Senegalese music. Participants and staff alike danced the night away as the end of last week’s Connect Camp drew near. On the final day of YALI CC 9, participants completed the final touches on their final projects, gave brief presentations, and were then given a tour of Blackboard, one of several Ohio University resources that they will have as alumni of this YALI program. All of the work they did this week, from inspiration to ideation to implementation, was drawn out in an easy-to-follow graphic by Dr. Judy Millesen of the Voinovich School of Leadership and Public Affairs at Ohio University. This tool corresponds to a multitude of resources now available to the participants, and serves as a road map from taking an idea through from its birth to implementation and success. 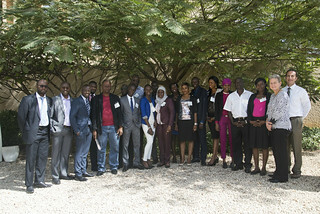 With this, the participants headed off to lunch, for a focus group-style evaluation, and to get ready for the evening, where they met once more for a final celebratory dinner, where they received certificates from Bob Post of the U.S. Embassy in Dakar.